At SisterGeeks, we love all things geeky and girly. We especially love when geeky and girly come together. And let’s be honest, what is more geeky than Star Wars and what is more girly than make-up?? Therefore, what is more SisterGeeks than Star Wars make-up!?!? Basically, nothing. CoverGirl has announced that, in September, they will be launching a limited-edition new line of mascaras, lipsticks, and nail polishes dedicated to the mega-hit series. There are some rumors that the line will include some eye shadows and blushes as well. The new line is perfectly timed to allow fans to get even more excited about the newest movie installment coming in December, Star Wars: The Force Awakens. The best part is that items from the new collection will have famous quotes from Star Wars as their titles. Who doesn’t want to buy make-up whose very name evokes the Force?? Okay, it probably doesn’t actually evoke the Force, but it’s pretty close. Pat McGrath, the makeup artist behind the new line, has designed two different palettes for the make-up, one representing the light side and one representing the dark side. Which will you choose?? While this is a brilliant marketing strategy for both the film and CoverGirl, it’s actually not a new idea. 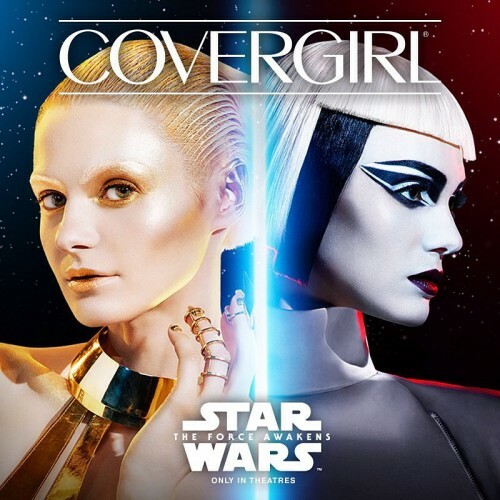 CoverGirl did a similar campaign in 2013 for the Hunger Games: Catching Fire. MAC has released themed limited-edition lines multiple times to represent everything from Hello Kitty to Wonder Woman. L’Oreal Paris and Yves Saint Laurent have also embraced the geeky love. Yves created its own Star Wars line in 1999. It’s no secret that geekdom is becoming more and more mainstream, so it is no surprise that CoverGirl would capitalize on what is predicted to be another box office hit. It will also be no surprise when this themed make-up line is a success. Fans of Star Wars love memorabilia and the ladies will love having something that is targeted specifically to them. We will see in the next few months just how lucrative this marketing ploy will actually be. Until then, we can just plan out the places we are going to wear our favorite looks from the new collection. Are you a Star Wars fan? If so, will you be purchasing items from the new collection? Do you agree that it is a smart marketing ploy by CoverGirl? What other franchise would you like to see made into a make-up collection? This entry was posted in Dani, Geek News and tagged covergirl, Star Wars, star wars: the force awakens. Bookmark the permalink. ← Geek Chic: REPRESENT ‘MUTANT ENEMY’ AWESOMENESS!